Autumn and Winter is upon us which means a whole new wardrobe. I am looking forward to bringing my warmer clothes forward and shoving my summer clothes back in the depths of my wardrobe, not to be seen again until next year. 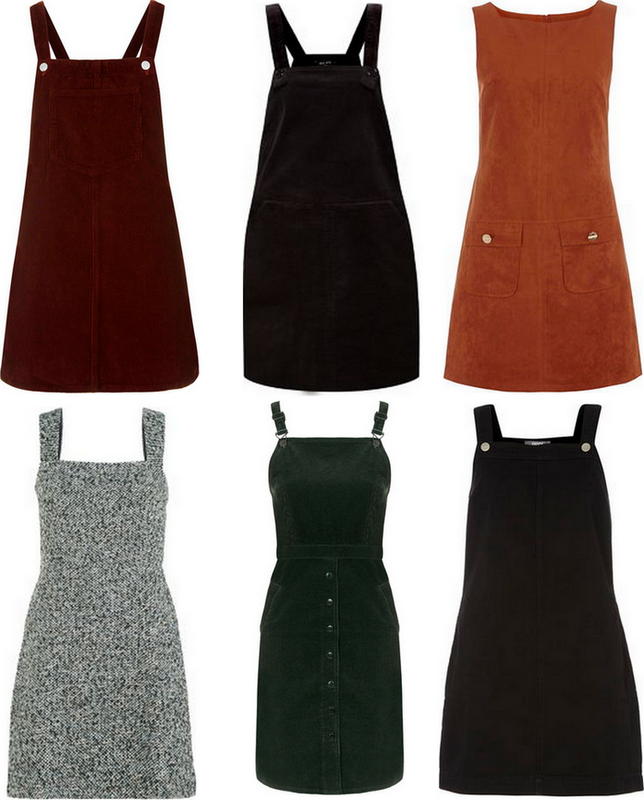 I have a few specific pieces that I want to add into my Autumn/Winter wardrobe and one of those is a pinafore dress. I have a really lame and boring story about my past with the pinafore dresses. When I was younger I saw one in a shop that I fell in love with. It was black and made out of polyester. I begged my mum to buy it for me and she did, along with a white t-shirt to wear underneath. And boy, did I wear that combo. So much so that the bobbled strap snapped when I was out and about all day. I tried my hardest to pull off the look with one strap dangling down but I am sad to say it ended up in the bin later that day. I am so glad that pinafore dresses are back in fashion. I am dying to get my hands on a red cord pinafore dress. I keep eyeing them up online and I don't think I can hold out for much longer! Here are a few of my favourites from the high street that are around at the moment. Thoughts?? I really love the burgundy, the green cord and the black textured dresses. I can see myself wearing them with a plain white long sleeved top underneath - just like my style inspiration, Cher from Clueless! Here are a few more alternatives too. Enjoy! I love wearing my pinafore dresses so im really glad they are back in fashion! I love that black textured one, it's so pretty!